There are 18 Assisted Living Facilities in the Albany area, with 4 in Albany and 14 nearby. The average cost of assisted living in Albany is $4,357 per month. This is higher than the national median of $3,346. Cheaper nearby regions include East Greenbush with an average starting cost of $3,000. To help you with your search, browse the 116 reviews below for assisted living facilities in Albany. On average, consumers rate assisted living in Albany 4.2 out of 5 stars. Better rated regions include East Greenbush with an average rating of 5.0 out of 5 stars. Albany is the capital city of the state of New York. It's also the oldest continuous settlement of the original 13 colonies and the birthplace of "a baker's dozen." Albany has a considerable senior population, with 16.4 percent of persons in the city over 65 years of age. Rather than being known as assisted living facilities within the state of New York, the Department of Health refers to these communities as adult care facilities (ACFs). ACFs are defined by the state as centers providing long-term residential services to adults who can't live on their own due to physical, mental, or other limitations. Three separate types of these ACFs are available in New York: adult homes, enriched housing programs and residencies for adults. There are 23 ACFs in the area surrounding Albany, with three directly within the city limits of Albany and 20 nearby. Cost of living in Albany is approximately the same as the national average with a ranking of 100.8 as opposed to the nation's flat 100, making Albany a viable option for seniors looking for assisted living in the area. Albany experiences harsh winters with temperatures often remaining below freezing from November to April. Albany's climate could pose a potential problem for seniors looking to spend time outdoors or who dislike cold weather. The violent crime rate in Albany is more than double the national average, with a score of 78.6 compared to the national average of 31.1. Such high crime rates could create unsafe situations for seniors to choose to settle in Albany. Air quality in Albany is worse than the U.S. average by eight percent. This could lead to breathing difficulties for seniors with lung conditions. The Albany area is home to world-class medical facilities, including St. Peter's Hospital, Albany Memorial Hospital and Albany Stratton VA Medical Center, in the event of medical emergencies or illness. Citizens age 65 and over qualify for half-fare when riding Albany's public transit system, Capital District Transportation Authority. Assisted Living costs in Albany start around $4,357 per month on average, while the nationwide average cost of assisted living is $4,000 per month, according to the latest figures from Genworth’s Cost of Care Survey. 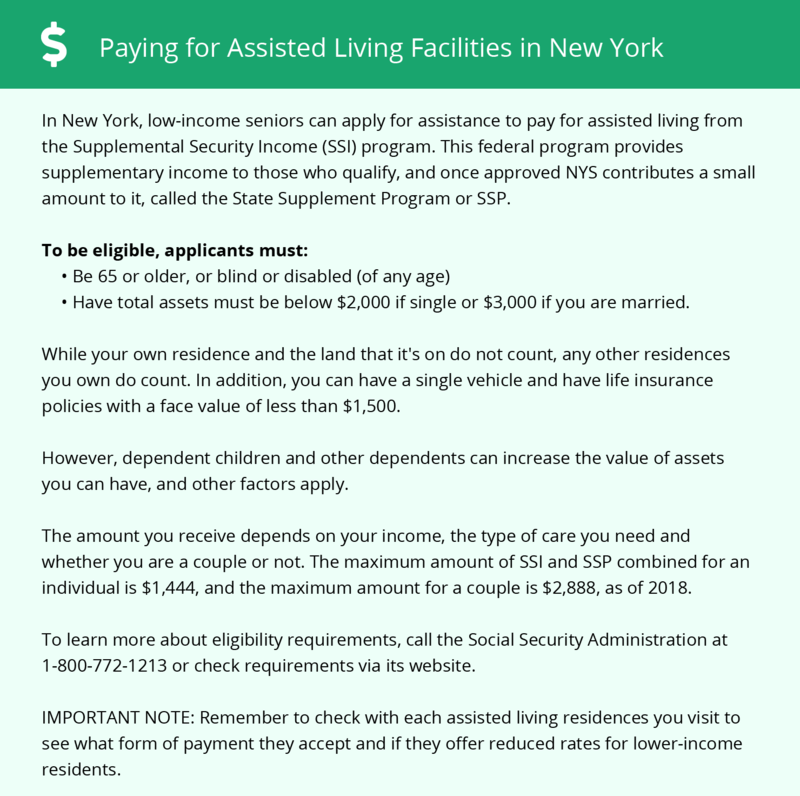 Through the Medicaid program, New York offers waiver programs to help eligible seniors pay for assisted living, including the Assisted Living Program (ALP) waiver. Though the ALP is open to both private-paying and Medicaid recipients, this waiver program is limited to 4,200 participants. To see a list of free assisted living resources in Albany, please visit our Assisted Living in New York page. Albany-area assisted living communities must adhere to the comprehensive set of state laws and regulations that all assisted living communities in New York are required to follow. Visit our Assisted Living in New York page for more information about these laws.